Last time I blogged I was in a completely different country where they speak a different language and use a different currency and where you didn’t have to say “It’s only money” every time you spent the equivalent of $5 for an ice cream cone. I’ve been taking notes because I’ve been doing so much stuff I was afraid if I didn’t write it down, I’d forget what I did. And I’m inclined to just copy my notes into my blog even though it would make for very dull reading. So to compromise I’ll just give some highlights. Apple pie (at a cafe called Winkels into the Jordaan, recommended by a former coworker who lived in Amsterdam for a while and also by Lealu, the guide on the walking tour I took earlier in the week). Herring. This was actually my first try. 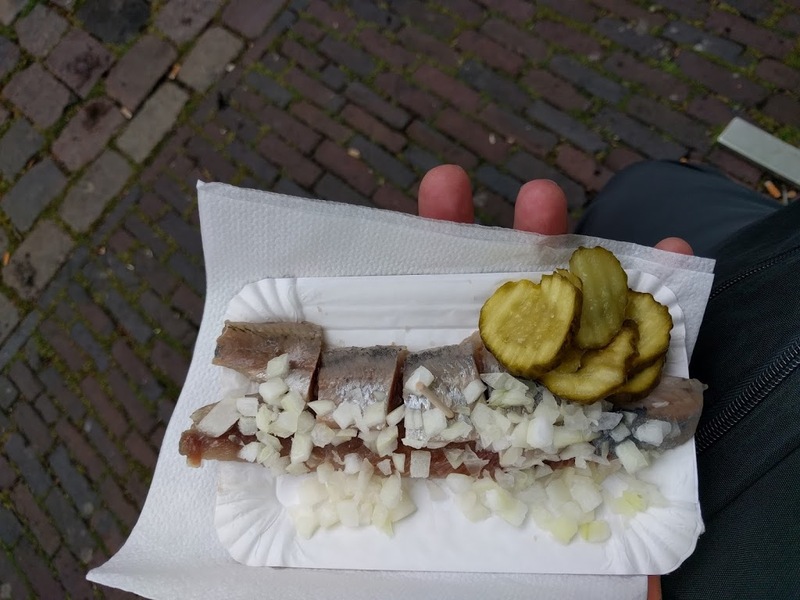 They served it on a plate with onions and pickles. It was pickled, and it tasted just like herring we used to have whenever my grandparents came to visit, except without the cream sauce. Friets. No mayonnaise this time, or ketchup either. And these were the best friets I had anywhere in Belgium or the Netherlands. I said I was done with museums in Amsterdam, but I did hit a couple more: the Rembrandt house, where he lived for a while (before he went bankrupt) and the Amsterdam Museum. The Rembrandt House was better than I was expecting. When he went bankrupt, he had to sell the house and all his possessions, which were thoroughly inventoried, and the inventory has survived, meaning we have an accurate record of what he had in the house, so it’s been recreated to look much as it did when he owned it. They also did an interesting demonstration of etching, which was how Rembrandt was best known in his lifetime. The Amsterdam Museum gave a good rundown of the history of Amsterdam. I also climbed the tower of the Westerkerk for an impressive view of the city (pictures coming later). My flight to Oslo was scheduled to leave at 21:30 and arrive at 23.15. But when the plane arrived, they had trouble with the jet bridge and it took more than a half hour to get it working. (I felt even more sorry for the incoming passengers.) Anyway, TMALSS, I didn’t get to my airbnb apartment until close to 1:00. The clerk looked it up by the reference number on my email confirmation and said, “This reservation is canceled.” For about 10 minutes she tried to find my reservation, but no luck. Then she found it: for June 16. I explained to her that I did not plan on staying in Oslo until June 16. She was going to try to call the company I bought the tickets through, but then she finally found the correct reservation in the system, and she printed my tickets, and all’s well that ends well. Headed home past the US Embassy (perhaps the ugliest building in Oslo) and took a break before heading to Aker Brygge (the fancy built‐up wharf along the side of the harbor) for dinner at a restaurant called Rorbua. I have no business posting this, because it’s boring. But I’m posting it anyway. Good night from Norway!